China's Qing Pang and Jian Tong currently lead the pairs after the short program at the 2011 Four Continents Figure Skating Championships. 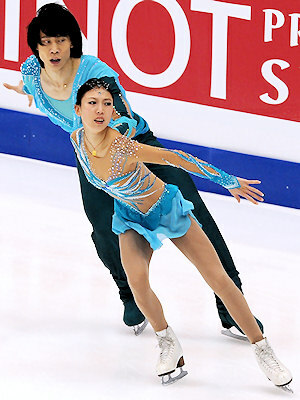 China’s World Champions Qing Pang and Jian Tong clearly won the Pairs Short Program at the ISU Four Continents Figure Skating Championships 2011 in Taipei, and are poised for their fifth title. Canadians Paige Lawrence and Rudi Swiegers and Meagan Duhamel and Eric Radford finished second and third. Pang and Tong put out a solid performance of their romantic routine to Je crois entendre encore from the opera The Pearl Fishers by Bizet. The Olympic silver medalists landed the side by side triple toe, a high triple twist and throw triple loop. Their lift and death spiral garnered a level four and the side by side spin and footwork were a level three. Pang and Tong achieved a season’s best of 71.41 points, however, they finished a little behind their music and were punished with a one-point overtime deduction. Lawrence and Swiegers turned in a entertaining program to City Slickers that was highlighted by a triple twist, triple toeloop, a throw triple Lutz, and a level-four step sequence. The Canadians scored 59.98 points. Swiegers actually became the hero of the day when he helped out rival skater Mark Ladwig (USA). Ladwig, who skates with Amanda Evora, fell on a triple toe early into the short program and couldn’t continue as the heel of the boot had come off. He limped off the ice and had three minutes to repair the boot. Swiegers, who already had skated in the first warm up group, was up in the stands watching the rest of the competition and didn’t hesitate for a second. ISU sports director Peter Krick praised Swiegers’ sportsmanship and presented him with a bouquet of flowers at the draw for the free skating. Performing to Concerto pour une voix by Saint-Preux, Duhamel and Radford risked a side by side triple Lutz, an element no other pair currently does and only few attempted in the past, but she fell. However, the other elements were strong: a triple twist, an Axel Lasso lift, intricate footwork and a throw triple Lutz. The Canadians earned a new seasons best with 59.92 points. Her new partner Radford is still amazed about competing at Four Continents. Unfortunately, it wasn’t a good night for the US Pairs teams. Caitlin Yankowskas and John Coughlin came in fourth after she doubled the toeloop and stepped out of the throw triple Salchow. Canadian Champions Kirsten Moore-Towers and Dylan Moscovitch came in fifth. Moore-Towers struggled with the landing on the triple toe and the position of their death spiral was not good and merited only a level one (54.41 points). Evora and Ladwig finished in sixth. In addition to Ladwig’s fall, Evora doubled the toeloop. However, after an involuntary pause, they produced a throw triple loop, level-four footwork and a good lift. Ladwig only wobbled on the spins (52.23 points). Evora was more upset about her own error than about the incident. Reigning World junior silver medalists Narumi Takahashi and Mervin Tran of Japan had an off-day. They both fell on the side by side triple Salchow which was downgraded, and Takahashi stumbled on the throw triple toeloop. The Junior Grand Prix Champions are currently ranked 8th.